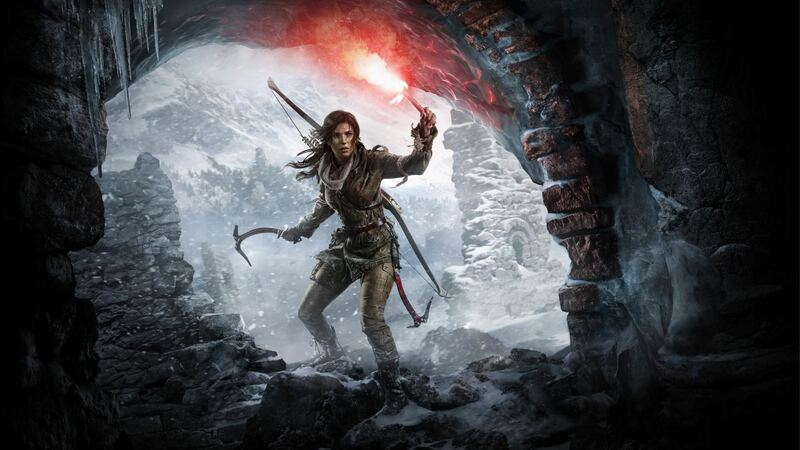 Rise of The Tomb Raider is the follow-up to the critically-acclaimed 2013 reboot. I’m pleased to say that if you enjoyed the original, you’ll love this. Lara Croft is in safe hands with Crystal Dynamics and she is better than ever. Lara returns and she is no longer the innocent victim we saw previously. Being shipwrecked on a dangerous island has clearly affected our heroine and she has blossomed into a confident and determined individual. It’s great to play as Lara as she is someone that you can aspire to. She’s intelligent, courageous and focused. She never shies away from dangerous situations, which she has a habit of finding, and is not afraid to make tough decisions when needed. Since the reboot, some have said that Lara has become too much of a killer and that topic is not only referenced here but is an important element of the game. As a child, I desperately wanted to be an archeologist and Lara embodies exactly what I thought that encompassed. I was perhaps influenced by watching the Indiana Jones movies, but now I get to live that dream vicariously through Lara. She will always risk her life in dangerous situations with an unwavering determination but when the chaos fades, you’ll see the educated Lara and her passion for forgotten history emerges. She has a childlike curiosity and shows genuine excitement for lost artifacts, tombs, and historical paintings. It’s rare to see such a well-rounded character in a video game and I felt really attached to Lara and submerged in her story. Lara travels to Siberia to complete her late father’s work. She is in search of the secret of immortality and as you can imagine, she’s not the only one. 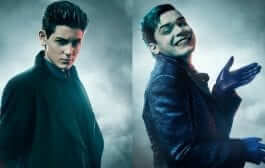 A villainous organization known as Trinity are also in search of everlasting life. The story coincidentally reminds me of Indiana Jones and The Last Crusade and it is a narrative which includes some great set pieces, deepened emotions, stunning revelations and a great deal more. You will fight helicopters, escape from crumbling mines and witness many other movie like scenarios. 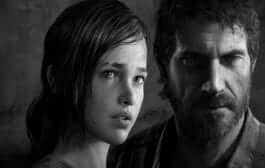 As the story is one which involves Lara exploring unfamiliar territory when you deviate from the narrative, it is not only accepted but widely encouraged. 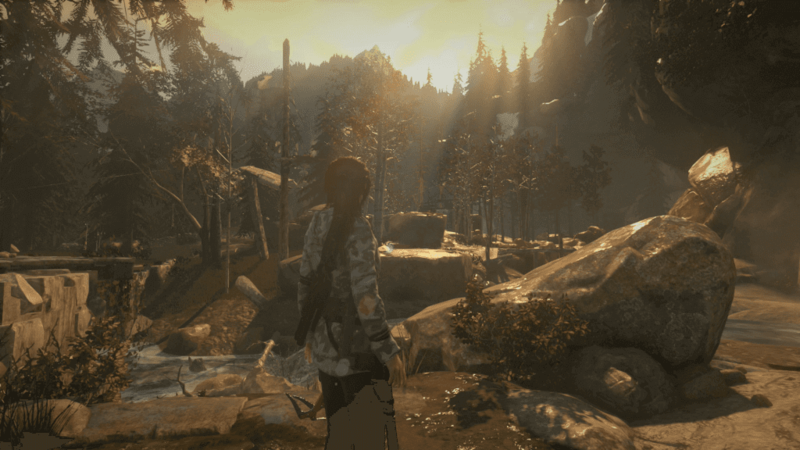 Rise of the Tomb Raider is three times larger than its predecessor and the size of the areas are astounding. It is great being able to see your destination in the distance and actually travel there. All of the spaces are really well designed and have multiple paths for you to follow. The different environments look beautiful with snow covered trees and mountain faces coated with ice. The action never really leaves Siberia, but Crystal Dynamics has managed to make each area feels distinctive. I never once saw a reused environment which, for a game of this size, is extremely impressive. You have three HUB areas which are gigantic and look aesthetically different from the others. In these areas, you can hunt animals, find collectibles, speak to the locals and more importantly, tomb raid. Tombs were a big highlight from the rebooted Tomb Raider, but there were too few to explore. Thankfully Rise of The Tomb Raider has combated this by including more and they are grand affairs. Visually, they are very different to the cold, harsh winter conditions of Siberia. Crystal Dynamics has cheekily used these tombs to transport you to completely different locations, however, it is warmly welcomed because they each feel unique and look gorgeous. You’ll find yourself in jungle temples, volcanic caves or old soviet bunkers. Each tomb contains a puzzle of varying difficulty, but all are intuitive and creative. I never found myself stumped and when it came close, using Lara’s survival instincts really helped highlight items of interest. Once you’ve completed the tomb, you’ll be rewarded with an exclusive ability and they can be extremely beneficial to your overall experience. When Lara is not exploring and unearthing hidden treasure, she’s usually involved in combat. Lara has a knack of finding trouble and you’ll fight the wicked Trinity organization throughout. Combat, however, is the weakest element in Rise of The Tomb Raider in my opinion. There are some great concepts here, but the aggressive nature of the enemies leaves you unable to utilize them. You have a number of weapons at your disposal and all can be effective when used appropriately. As Lara is now more adept than ever, she can pick up regular items such as cans or bottles and tinker with them to create smoke bombs or Molotov cocktails. Issues can arise when using them in conflicts as enemies will constantly run towards you. At times, they seem to have no regard for their own safety and will openly attack you head on. This makes it easy to eliminate them but prohibits your creativity. This still happens on the easiest difficulties and I would miss unique opportunities to slay foes with environmental objects. As the game draws to a close, these encounters increase. Fighting waves of soldiers is not what Rise of The Tomb Raider is about and I felt somber that it concluded this way. In contrast, stealth combat feels excellent and natural. Lara will instinctively use bushes and obstacles for cover and you can now climb trees for an aerial assault. Using Lara’s instincts, you can see which enemies can be seen by others. If a foe is yellow, no one can see him and you can dispose of them without alerting anyone. It is a great touch because nothing is more frustrating than when you are spotted by an enemy which you were sure couldn’t see you. A lot of the skills you will unlock can be exploited here too. Take out a guard, booby trap his radio to explode and you can kill his ally when he examines the body. Line up three head shots with your bow and watch as Lara takes them all down simultaneously. Lara is a force to be reckoned with and you can’t help but smile when you hear an army coordinate their attacks to take down a singular person. Depending on how you want to approach situations, Lara can accommodate. There is a wide range of customization available here be it weapons, abilities or outfits and each is useful in their own way. You’ll discover weapon parts during your travels and once you have enough pieces; you can craft a new firearm. You have a pistol, rifle, shotgun, and bow but each model will change how they perform. You can either use a single shot rifle which packs some clout or a rapid fire rifle with less accuracy. You can then upgrade these weapons if you desire. Attachments will either improve the stats of the weapon or you can spend your rare Byzantium coins to buy special equipment such as a silencer or grenade attachments. The skills you unlock will define Lara. You have three categories; brawler, hunter, and survivor. As you traverse Siberia you’ll be granted experience points and they can be redeemed at campfires. These classes relates to your play style. Enjoy direct combat? Invest in brawler skills and you’ll be able to counter attack enemies and instantly kill them. Want to hunt wildlife? 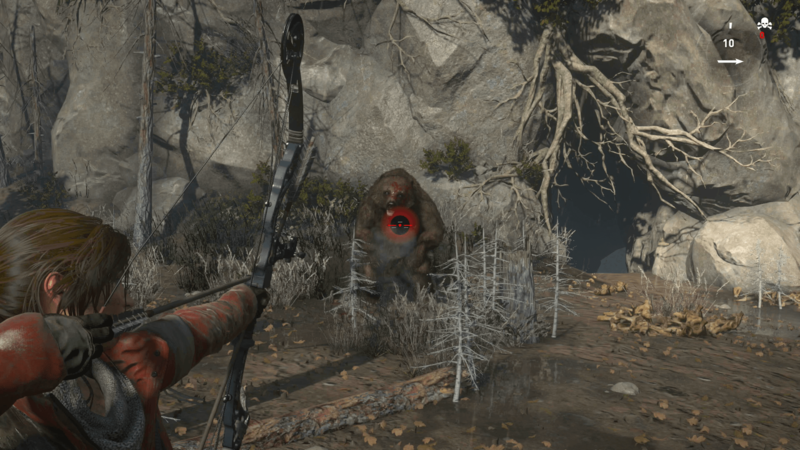 Spend your points on survival skills so you can locate wild animals and be able to detect their hearts for quick kills. As you accumulate skill points, you will level up and this unlocks new tiers in each group. To unlock them all is not a quick feat so choose your abilities wisely. A great feature in Tomb Raider was the ability to revisit past locations with new tools to reach inaccessible areas. This mechanic returns and you are granted new gadgets to achieve this. 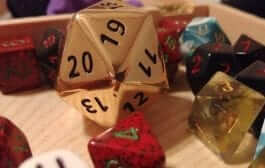 You do not start with all the apparatus from the original game, but you quickly acquire them and many more. A grappling hook will enable you to reach high ledges and swing between large gaps. You’ll also be able to fire arrows into wooden walls and use them as steps to reach high areas. These items give you more maneuverability than seen in the previous game. Crystal Dynamics has created a beautifully detailed world, be it the surroundings or Lara herself. Seeing Lara adjusting her hair after resurfacing from swimming or the subtle eye movements she makes when accessing a new area brings forth a sense of realism. The whole game is gorgeous, particularly the lighting. The sunlight can not only set the mood but seeing small rainbows created when the light hits the mist is stunning and only enhances the atmosphere. When entering each locale, I would take a second to look around and absorb the beauty of the scenery around me. 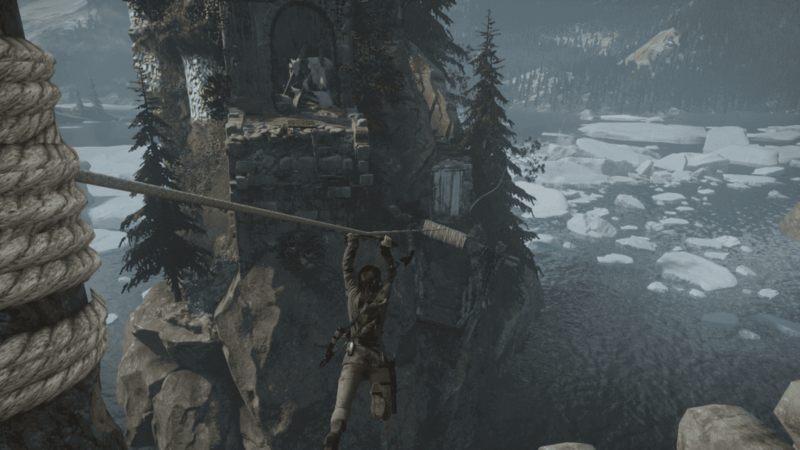 Rise of the Tomb Raider does everything thing that a sequel should. Crystal Dynamics has taken what made the last entry great and refined it in every way. The new world is bigger, the story is more ambitious and there is a vast amount of things to see and do here. Whilst the combat does need improving, everything else in the gameplay feels enjoyable and utterly delightful. Once the story is complete, you will have the option to replay levels with added stipulations which alter the gameplay. 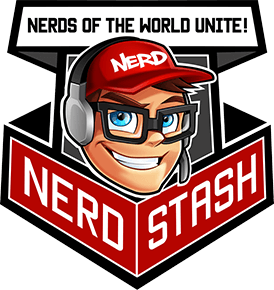 There are online leaderboards and you can even create small, mission based levels for others to play. Lara Croft has returned and she is not going anywhere soon. I simply cannot wait to embark on her next adventure. Rise of the Tomb Raider is an upcoming action-adventure video game developed by Crystal Dynamics and published by Microsoft Studios and Square Enix. It is the sequel to the 2013 video game Tomb Raider. Lara Croft is back and she's here to stay. Lara has matured and become the Tomb Raider we recognize. 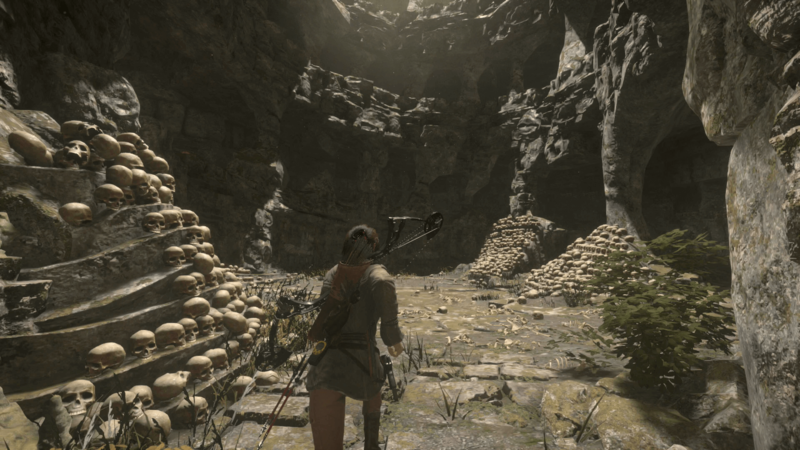 With wonderful level design, heaps of activities and an engaging story, Rise of The Tomb Raider is a joy to play. Why Was the Overwatch Graphic Novel Cancelled?